Save for the possibility that some poltergeist has taken possession of a horribly terrifying clown doll and is camped out beneath my bed while waiting for me to lean over for a peek, the idea that some unseen, phantasmic force could do me bodily harm generally doesn’t move me to fears. Because of this, a whole subgenre of horror holds little appeal, too full of magical encounters and dubious decisions to fully exploit its common themes of invasion, violation, and dread of the unknown. Take away the ethereal specter and replace it with a flesh-and-acid-for-blood monster with two mouths, however, and you get one of the best haunted house movies ever made: 1979’s Alien. Sure, many liken Ridley Scott’s film to more of a sci-fi slasher flick, with its single-minded killer and death toll, but the lack of depicted violence places less emphasis on the slaughter (save for one nightmare-inducing scene, actual loss of life takes place off-screen), and the sterile, amoral nature of the characters doesn’t fit with the type of “punishment” the subgenre is known for. Instead, despite the body count, Alien plays more like an exorcism story, with a demon born from man’s folly that must be expunged before it eats the souls of everyone on board. 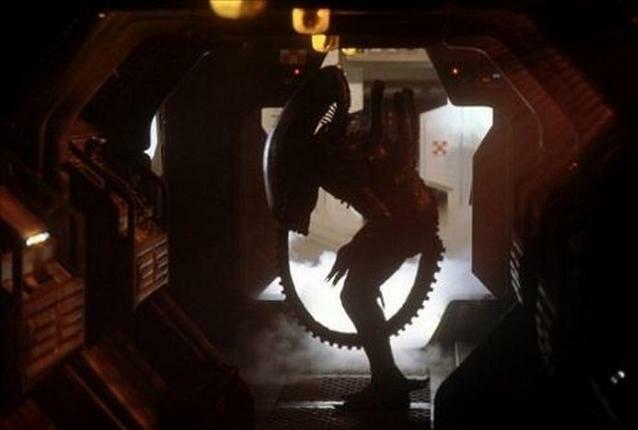 That the xenomorph is not a proper apparition not only doesn’t destroy the metaphor, but instead benefits the suspension of disbelief greatly, and (other-worldliness notwithstanding) its tangibility makes the mortal consequences of crossing its path all the more real. Alien‘s lack of ghosts also allows it to focus on what physical elements make the haunted house scenario such a scary one in the first place. First and foremost is the house itself, which has always worked best when it serves as the main characters’ home. Though the classic device of a group challenged to spend a night or two debunking frightful legend can still manage the occasional creep-out, real fear in the genre comes from invasion of places we feel most safe. While a commercial spaceship, the Nostromo is nevertheless home to a small crew that has been out to sea for a very long time. They eat there, sleep there, live there. It has protected them, sheltered them well from the cold vacuum of infinite space, become as depended upon and familiar as their own bodies. The arrival of the titular guest is like an infection, betraying the trust of those familiar hallways and life-giving air ducts. What once could be navigated without a care instead now demands unrelenting awareness and caution, as the potential of attack and death lurks around every corner. No time to rest, always on the lookout, hunted on their own turf by a force that seemingly appears out of nowhere. Instead of this elusive being originating from some mystical plane that audiences can’t relate to, Alien gives them a simple predator, instinctively understood in mankind’s collective subconscious as shudderingly lethal, and sets it loose upon the unsuspecting prey. Now, upon invasion, both ship and one’s own skin have the potential to be horrifying traps from which they cannot escape. This intrusion into personal space perfectly captures the violation at the heart of the best haunted house movies. Sanctuaries are often taken for granted in life, whether they be built of wood or flesh; pull the rug out from underneath that security and there is instant unease and possibly panic. Alien harnesses this instinct in dual ways, attacking audience comfort with both the dependability of home and their own selves. When even the internal functioning of one’s body can’t be trusted, then utter vulnerability is all that’s left. The most terrifying aspect of possession is the loss of control, the idea that one’s destiny is no longer their own to determine, but some foreign entity’s. How ghosts do this is vague and unexplainable, but Alien handles this very supernatural concept in a non-literal and insidiously physical way, portraying a ravenous parasite that decides when the duties of its host will ultimately come to an end. Once the seed has been planted inside its victim, fate has been sealed. The realization after Kane’s interrupted dinner that this ticking time bomb is a death sentence only makes the situation more anxious, evoking a sense of squeamish helplessness both outside and in. Haunted house movies often strive for this effect, but reason stands in the way. Traditionally these stories tend to invent excuses as to why the people would remain in this hell through the duration. Aware of the great big world outside that any rational person would immediately bolt to when things go south, writers often resort to contrived behavior (insane curiosity, mind-blowing nonchalance, bizarre revenge, etc.) or magical limitations to keep everyone indoors. The ghost made the door into a wall. How? No one knows; it’s a ghost. Buying into a setup requires a modicum of believability in the characters’ motivations behind their actions that many haunted house movies often can’t muster, but Alien handles the situation organically through its setting. With an outside environment more hostile than the one within, the choice to stay in Alien is clear, but more importantly, logical. If no one can hear you scream, what hope is there of rescue? The crew is truly alone, and that is truly frightening. Director Ridley Scott composes the film handsomely, with vast shots of the speck the Nostromo is against the backdrop of the cosmos, and clean, claustrophobic interiors that add to the overall feeling of unease. The ship is a labyrinth to rival any spooky mansion, full of emptiness and echoes. 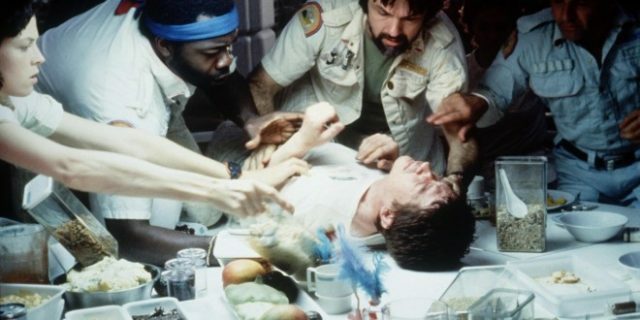 There are seven characters aboard the Nostromo (Italian for “shipmate”): Captain Dallas, Warrant Officer Ripley, Executive Officer Kane, Navigator Lambert, Science Officer Ash, and two Engineers, Brett and Parker. This is all we get; we’re stuck with them just as they are with each other. This is one of my favorite storytelling setups: the small group isolated and forced to work together to survive, and Alien is one of the most satisfying. By the time the alien erupts (literally) onto the scene we have gotten a good sense of who these people are, and how incapable they are of dealing with such a situation. And it is grim. Always a step behind, they struggle to maintain their souls against a wraith-like force they cannot comprehend, tormented by an alien intruder that has turned their own world against them, haunted by a phallic-headed monster with two mouths that is very, very real. The haunted house movie is a cinematic horror staple, yet I’ve never seen it done better than a movie with no house and no ghosts. With a terrific setup, a spooky atmosphere and an H.R. Geiger-designed creature that will make your flesh crawl, those looking for some terror in their movie nights should consider the scariest film in the franchise, Alien. I just watched Even Horizon again and it made me think of this article. That would be the utimate haunted house movie. Man, I didn’t care for that movie at all. Space demons! That’s what I like about ‘Alien’- it keeps the terror physical. I do know a lot of people who like that film though. I just can’t handle anything by W.S.